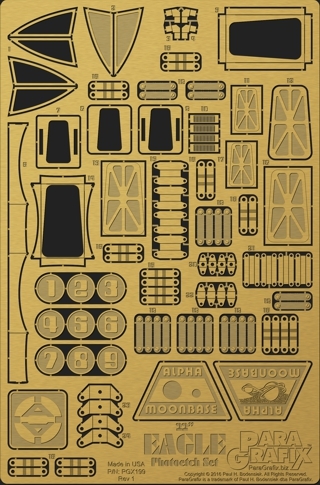 Add exciting new details to the huge 22" long Eagle Transporter kit from MPC! Window frames for the cockpit windows to make painting a snap. Two alternate frames are included for the lower windows that do not include the through holes. Clear plastic sheet for distortion free views of the cockpit (enough is included to do the passenger pod windows as well). BONUSES: Moonbase Alpha logos as used in the first and second season, Eagle identification numbers, the "AA&qruot; Alpha door logo.